When New York Times columnist Ross Douthat surveys the American cultural landscape, he sees a country whose growing detachment from traditional forms of Christianity hasn’t made its people stronger, happier, wiser, or more moral. Not by a long shot. 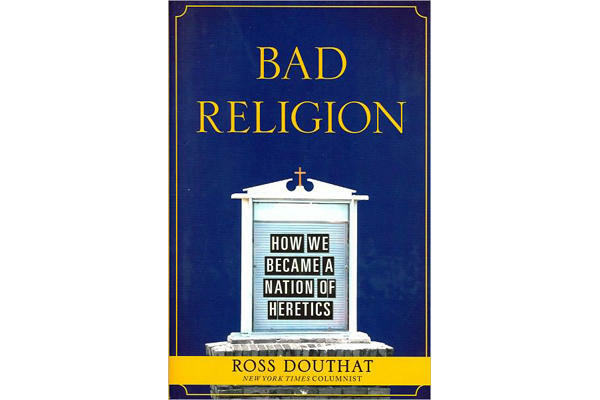 “Bad Religion” represents Douthat’s sweeping attempt to explain the sea change that has washed over American religious culture since the 1950s and to assess what’s been lost and gained. He delivers a penetrating intellectual history. Douthat embraces orthodoxy, or core Christian teachings that have constituted the church and defined believers for nearly two millenniums. He revels in orthodoxy’s inherent paradoxes: that one is saved by grace through faith, but faith must be accompanied by works; that God loves everyone, yet Judgment Day is coming; and so forth. Conforming lives to orthodox teachings isn’t easy for anyone, Douthat argues. But the effort, as practiced by Roman Catholics and Protestants, historically elicited private and public virtues that served America well for centuries. The orthodox center, however, failed to hold through such earthshaking events as the sexual revolution of the 1960s, which left Americans rethinking much of what they’d been taught. In Douthat’s account, mainline Protestantism followed Harvard Divinity School professor Harvey Cox down a deadly path that blessed secular values – and left the masses with no compelling reason to stay involved in church. “Bad Religion” is an important book. It brings a probing, perceptive analysis to bear on the tragic hollowing out of American Christianity. In Douthat, readers have a guide who explains how we ended up drinking at a narcissistic trough draped in spirituality that doesn’t quench anybody’s deepest thirst. Critics of “Bad Religion” have contended that Douthat conjures an unrealistically rosy past, marked by an orthodox harmony that in fact never really existed. But Douthat doesn’t suggest that we’ve lost a perfect golden age. Instead he contends we’ve lost an important common touchstone whose timeless wisdom and character-shaping power is needed now – in a time of entrenched political conflict and moral confusion – as much as ever. In that, he’s right. Yet it’s a point seldom heard in a culture where all spiritual paths get celebrated, even those that lead nowhere. “Bad Religion” occasionally comes up short when Douthat overreaches. Douthat can be forgiven, however, for casting his topic sentences a tad too broadly now and then, as when he overstates how evangelicalism suffered under the presidency of George W. Bush. He is, after all, exploring a topic as vast and significant as America’s religious heritage. The greater sin would have been to aim too low.